Boutique vendors usually offer more variety of options for parts than major manufacturers do. And that’s one of the conveniences you get with iBuyPower and other OEMs like CyberPowerPC and Eluktronics. iBuyPower features beautifully designed PCs with tempered glass side panels, and high-end components for intense gaming. The PCs are rigorously tested by professional gamers and tweaked to the standards gamers desire in their own gaming rigs. It is easier to find such entry-level gaming PCs that don’t need immediate upgrades with high-end features. As a matter of fact, the iBUYPOWER Slate 9200 Gaming PC Desktop we review today is one such example. It comes with excellent performance and dollar-to-dollar value. The iBUYPOWER Slate 9200 Gaming PC Desktop hits all the right boxes in terms of impressive aesthetics, high-end features, and pricing. 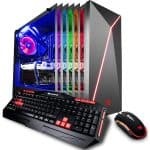 It offers the best inline components including 3.7GHz six-core i7-8700K processor, 16GB DDR4 memory, 1TB HDD storage, Nvidia GTX 1070 with 8GB VRAM, RGB light interior, and water-cooling. Additionally, the huge tower is spacious enough to house future upgrades and keep the system running cool. All that, plus a complimentary keyboard and mouse come together to make a fine gaming performer worthy of every level gamer. As a result, it receives our Editor’s Choice award for budget entry-level gaming desktops. Desktops are about power and the iBUYPOWER Slate 9200 Gaming PC Desktop takes its performance and aesthetic cues from the best rigs in the industry (similar design to its sister, the iBuyPower Slate 9210 Gaming Desktop we reviewed recently). The general design is simple, a little toned down even, save for the RGB lighting gracing its interior. iBuyPower, like many other boutique desktop manufacturers, decided to go for a tempered glass side panels. It’s a remarkable concept, especially if you like dimming your room’s lighting while gaming. The right side glass panel allows plenty of colors, glitz and glamor giving your room just right ambiance for gaming. Also, the motherboard and cooling fans can be clearly seen through the glass while in action. If you’re a gamer on a budget and Windows-centric, then this PC might be a good fit for you; aesthetically and performance wise. The desktop measures 25 x 12.5 x 21.4 inches and weighs 30 pounds which makes it a more table friendly PC. It takes up plenty of space too, more than most people have. So for the most part, we recommend having it on the floor. On the other hand, there’s plenty of space inside for expansion in the future (You can access the hood by loosening the four screws holding the panel). The interior is roomy and clean with neatly done cabling. We noted that there’s more light-blue interior lighting giving the interior a cool high-tech vibe. Note: Admittedly, the top has no handle for toting it around whenever you need to, so you might just have to figure out a way to carry it for LAN parties. The front part is made of an aluminum case with a warm a gray finish and pink strip cutting across. The pink strip and a roaring lion logo at the bottom of the chassis are representative of the iBuyPower brand. The mix of ports comprises of forward-looking ports with the exception of a USB-Type-C port. Otherwise, the port system is healthy. There are four USB 3.1 ports, two USB 2.0 ports, a single RJ-45 connector, and an Audio: 7.1 Channel. Other additional connectivity options include a Network Ethernet 802.11AC Wi-Fi adapter. The most outstanding thing about the iBuyPower Slate 9200 Gaming Desktop is the cutting-edge components. Just like its sister the iBuyPower Slate 9210 Gaming Desktop, its processor is modern and is backed up with other forward-looking components too. You get a Core i7-8700k processor, 16GB DDR4 RAM, 1TB Hard Disk ( and 240GB SSD), and Nvidia GeForce GTX 1070 8GB graphics card. The side panel enables a clear view of the guts; motherboard and all. Still, on impressive, our interest was peaked by the eye-popping six-core Coffee Lake CPU. iBuyPower brags of this Intel Core i7-8700K processor which is currently among Intel’s top mainstream processors. It is a high-powered CPU with an aptitude for 3D tasks, gaming, and other graphics/ power-intensive tasks. While in action, it operates at a base clock speed of 3.7GHz, and 4.7GHz when overclocked. On benchmark scores, it managed a nifty Average CPU Mark of 16,011 which is relatively impressive compared to other CPUs. It’s worth noting that we’ve seen other systems with similar multi-core-reliant Coffee Lake processors and their common denominator is improved performance. The iBUYPOWER Slate 9200 Gaming PC Desktop is no exception to this too. The Dell Inspiron Gaming desktop (5680) is also one such desktop with similar outstanding performance thanks to its CPU. The iBuyPower 9200’s real prowess in multimedia and multitasking is shown in web browsing, Handbrake tests and Photoshop times. But the other reason is due to a fast 16GB DDR4 memory that supports all the multi-core tasks. In gaming performance, the Nvidia GeForce GTX 1070 comes in handy. While the card is not Nvidia’s crème de la crème, it is a powerful card capable of remarkable Full HD (1080p) and 1440p video and gaming. Also, the card is overclockable, power efficient and runs quietly. Additionally, you can get your Virtual Reality groove on both HTC Vive and Oculus Rift. As we all know, the Nvidia GeForce GTX 1070 takes a back seat to the Nvidia GeForce GTX 1080. That’s mostly because of a slightly less advanced two-way SLI and lack of GDDR5X memory. In essence, that means the iBuyPowerPC won’t play 4K and 1440p video as well as the Nvidia GTX 1080 card. Even so, the Nvidia GeForce 1070 is still a powerhouse on its own right, and the fact remains that in gaming it delivers the best…well second best performance. On gaming runs, it handled well even the most demanding games with a just a few dipping frames on cranked up settings. For most titles, it played above 60fps on maximum settings. Dirt Rally played with silk-smooth clarity with 137 fps on 1080p settings and 97 fps on 1440p. The 4K performance was a bit more wanting at 57 fps. On Middle-earth: Shadow of Mordor it calmly collected 130 fps on 1080p settings and 88 fps on 1440p. The performance on 4K was notably low again at 50 fps, but still playable. In general, the card shows more game worthy gameplay on 1080p and 1440p and more challenge on 4K gaming. Given the premium components on this desktop, impressive performance should not come as a shock. The processor offers more speed than most people will ever require especially if they’re on other run-to-the-mill tasks such as office tasks. For power users and gamers, it should serve them well. The six-cores should work perfectly on multithreaded tasks such as gaming and handling of graphics intensive software like CAD. To be precise, the iBUYPOWER Slate 9200 Gaming PC Desktop flexes it’s muscles well in day-to-day and multithreaded tasks with flair. Only a few prebuild PCs can stack up to what this system offers. If you’re looking for real power on a budget, consider the iBUYPOWER Slate 9200 Gaming PC Desktop. It should be a mouth-watering option for gamers who don’t mind an understated design packed with power.